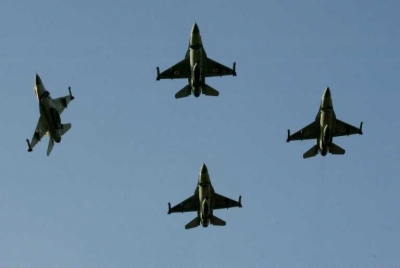 The Obama administration has announced it will go ahead with the shipment of four F-16 fighter planes to the Egyptian military, signaling its intention to ignore US laws requiring a cutoff of aid to countries that have suffered military coups. This gesture of support to the so-called interim government, which is dominated by the Supreme Council of the Armed Forces (SCAF) and its top commander, Gen. Abdul-Fattah el-Sisi, comes as the ruling junta is intensifying its police-state crackdown against supporters of ousted Muslim Brotherhood President Mohamed Mursi. The ruling junta has cynically justified its orders to arrest leading figures in the Muslim Brotherhood by claiming that they bear responsibility for the army’s July 8 massacre of at least 55 demonstrators who had marched on Cairo’s Republican Guard compound, where Mursi was believed to be held prisoner. The military and the Egyptian media have cast the incident, in which several hundred other unarmed demonstrators were wounded, as a “terrorist” attack on the army. The bloodletting has raised the specter of a civil war erupting in Egypt, with mounting concerns that demonstrations called by Muslim Brotherhood supporters for Friday after the mosques let out, and a rival rally called by their opponents among the bourgeois liberal and pseudo-left forces of the Tamarod (“rebel”) coalition in Cairo’s Tahrir Square, could produce clashes in the Egyptian capital. Egypt’s public prosecutor has ordered the arrest of Muslim Brotherhood leader Mohamed Badie and at least nine other senior members of the Islamist party, while hundreds of others are being hunted down for participating in Monday’s bloody protest. The Muslim Brotherhood charged that the arrest orders could serve as a pretext for the violent breakup of a protest vigil that the group and thousands of its supporters have been staging at the Rabaa Adawiya mosque in Cairo. A legal finding that a coup had taken place would require that the US administration cut off some $1.5 billion in annual aid to Egypt, $1.3 billion of which goes directly to the country’s military. Since 1948, Washington has poured some $40 billion in military aid into the country, ensuring the Egyptian military’s dominance of the country’s political life. More significantly, the White House has ordered a scheduled delivery of four F-16 fighter jets to proceed as planned. It is part of an arms package consisting of 20 of the warplanes, eight of which have already been delivered. Multiple press reports have pointed to a direct US role in the coup that toppled Mursi. In a July 6 report, the New York Times detailed discussions involving US national security adviser Susan Rice and other US officials in the period proceeding Mursi’s overthrow. According to the report, an Arab foreign minister “acting as an emissary of Washington” delivered a final ultimatum to Mursi ordering either that he accept being turned into a figurehead president with a government appointed by the military, or that the military would overthrow him. Mursi’s foreign policy adviser, Essam el-Haddad, then held discussions with the US ambassador to Egypt, Anne Patterson, and with national security adviser Rice and was told, after Mursi rejected the offer, that the coup would begin. The funding, provided under the guise of “democracy assistance,” came through various US agencies, such as the Middle East Partnership Initiative (MEPI), the National Endowment for Democracy (NED), the State Department’s Bureau for Democracy, Human Rights and Labor (DRL) and the US Agency for International Development (AID). This description applies to a number of pseudo-left organizations, including the Revolutionary Socialists, which backed the coup, after having previously claimed that the electoral victory of the Muslim Brotherhood represented a victory for the Egyptian revolution. The role of these groups has been to assist the Egyptian bourgeoisie by working to divert the mass struggles that erupted against Mursi’s right-wing policies into political support for the military coup. In addition to the US funding, the Tamarod was backed by major political and financial interests linked to the old US-backed dictatorship of Hosni Mubarak, who was toppled by the mass revoluionary struggles of 2011. “Working behind the scenes, members of the old establishment, some of them close to Mr. Mubarak and the country’s top generals, also helped finance, advise and organize those determined to topple the Islamist leadership, including Naguib Sawiris, a billionaire and an outspoken foe of the Brotherhood,” the New York Times reported. Sawiris told the Times that he “donated use of the nationwide offices and infrastructure of the political party he built, the Free Egyptians. He provided publicity through his popular television network and his major interest in Egypt’s largest private newspaper. He even commissioned the production of a popular music video that played heavily on his network. In a further indication of the character of the anti-Mursi coup, the right-wing oil monarchies of the Persian Gulf have rushed to provide economic assistance to the military junta. Saudi Arabia, Kuwait and the United Arab Emirates have between them pledged $12 billion in aid, clearly viewing military rule as more compatible with their own dictatorial regimes than the Muslim Brotherhood government.